All of these SE Asian temples are oriented against the poles of the earth and the solar system so you can often get these symmetric shots. 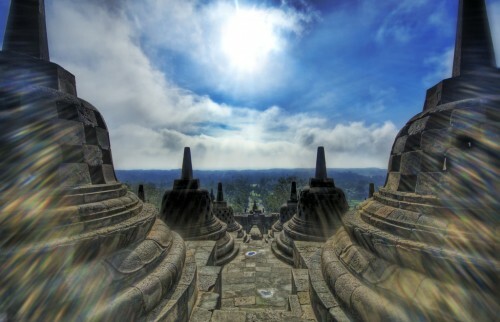 This was shot from the top of Borobudur when the sun was burning down at about 100 degrees of hot waves of humid heat. Oriented against the poles of the earth I understand. The solar system I don’t… care to expand on that a little? What you’re actually saying is that the temples are symmetrical and built in straight lines. The city I believe was square. i know it’s not CGI, but strangely it kinda looks like it.